Recently, I was given an opportunity to review the latest (fourth) edition of the classic The Researcher's Guide to American Genealogy by Val D. Greenwood, published by the Genealogical Publishing Company of Baltimore, Maryland in 2017. I had been hearing exclamations of elation about the newest edition being published from various professional genealogists with whom I am friends on Facebook, so I jumped at the chance to review it. Also, who doesn't like free genealogy books? Ironically, when I first heard that this book had been updated, I didn't consider purchasing it. I have at least four comprehensive genealogy guide books in my home library, so why did I need another one? I've been doing this thing called genealogy for 30 years now, have taken a professional course, and taught classes. Was there anything this book could tell me that I really didn't already know...anything of enough additional value that it would warrant a purchase of a generalized topic such as "American genealogy"? As you can see, this is quite an exhaustive lineup of background resources and records. Much of the first seven chapters reminded me of what I learned in my ProGen class. For instance, Chapter 3 specifies excellent strategies of "pre-search": determining what research needs to be done and how to approach it. The following chapter on "Evidence" explains proof and evidence, details the Genealogical Proof Standard, types of evidence, and types of sources. Chapter 7 offers different methods of note taking and the recording of research results, as well as how to analyze the information found therein. For these reasons, I have to say this content makes an excellent reference for both the beginning and intermediate genealogist, to provide and maintain the fundamental steps of good research. One chapter I felt could have been stronger was the one titled "Computer Technology and Family History." For one, the title is redundant and should have "computer" removed. For another, DNA is discussed in this chapter, which seems completely out of place (the following chapter, "Family History on the Internet" is a better fit). Also, there is a list of computer-related terms and their definitions that are not put in context with genealogy, and thus appear unnecessary. An example is the term "https" found at the beginning of many web addresses. While the term is defined to explain that websites with this in their address are secure, giving the reason as to why that would be important to a genealogist is lacking; i.e., making an online purchase of genealogy materials, subscribing to a major genealogy website, or accessing DNA results online. Finally, no modern book on genealogy with a chapter on technology should ignore mentioning the importance, availability, and substantial number of genealogy apps on smartphones and other devices. In Part 2, I was particularly impressed with the content of Chapters 16 through 23, encompassing probate, land, and court records. This meaty section is full of legal definitions, the processes involved in probate and purchasing and selling land, resources spelled out by state, tables of figures, and sample documents. In these eight chapters, my question about whether a purchase of yet another genealogy guidebook would be warranted was satisfactorily answered! Finally, throughout the book, as I've browsed and skimmed, delved and devoured, I have discovered little gems; things that were new to me, a seasoned researcher. These include descriptions of various library classifications systems, notes about Virginia's independent cities, and a link to the Family History Guide (http://www.thefhguide.com). My takeaway is that this book does belong in your home genealogy library. It also requires some in-depth study. DearMYRTLE will be offering a six-month online book study and discussion on Google Hangouts beginning February 28th (you can register here). 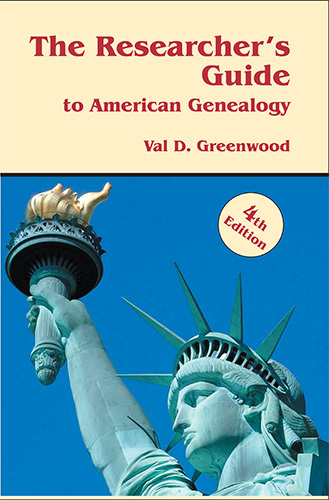 The Researcher's Guide to American Genealogy, 4th Edition, by Val D. Greenwood, is available at the Genealogical Publishing Company or Amazon for $49.95. Disclosure: I received a free book from the Genealogical Publishing Company (GPC) for review. As a GPC Associate and an Amazon Associate, I receive a small percentage of the purchase price when readers purchase a title through the GPC or Amazon links above.